Graduate Director, World Cultures & Literatures M.A. Alessandro Carrera was born in Lodi, Italy. He has a Laurea in Philosophy from the Università degli Studi of Milan and a Ph.D. by Publications in Music, Humanities, and Media from the University of Huddersfield, U.K. From 1975 to 1982, he was a music critic, a songwriter, and worked in the Milanese musical milieu. From 1982 to 1987, he worked as an executive editor of scientific magazines and pursued scholarly and creative interests. In 1987, he came to the United States as a Lettore d’italiano, a teaching position sponsored by the Italian Ministry for Foreign Affairs. In that capacity, Carrera taught Italian Language and Literature at the University of Houston (1987-1991), McMaster University (1992-1994) and New York University (1995-2001). As a Visiting professor, he also taught graduate courses in Italian Literature (Columbia, CUNY, SUNY), Comparative Literature (Rutgers), and Aesthetics (New School University). In 2001, the University of Houston hired him as Director of Italian Studies. 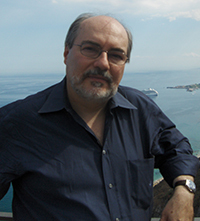 He is now Full Professor, Director of Italian Studies, and Graduate Director of World Cultures and Literatures. In addition to his scholarly and creative books in Italian, Carrera has published several articles and edited volumes in English. He has edited Massimo Cacciari’s The Unpolitical: For a Radical Critique of Political Reason (New York: Fordham UP, 2009), Italian Critical Theory (“Annali d'Italianistica” 29, 2011, Monographic Issue), Music and Society in Italy (“Forum Italicum,” 49, 2, 2015, Monographic Issue), and Massimo Cacciari’s Europe and Empire: On the Political Forms of Globalization (New York: Fordham UP, 2016). He has co-edited Emanuele Severino’s The Essence of Nihilism (London: Verso Books, 2016, with Ines Testoni). Carrera has also translated into Italian three novels of Graham Greene (The Third Man, The Quiet American, The Honorary Consul) and the songs and prose of Bob Dylan (Lyrics 1962-2001, Tarantula, Chronicles Vol. 1). Carrera has been the recipient of the Montale Prize for Poetry in 1993, the Loria Prize for short fiction in 1998, and the Bertolucci Prize for Literary Criticism in 2006. Laurea in Filosofia, Università degli Studi, Milan, Italy, 1980. Ph. D. by Publications in Music, Humanities, and Media, University of Huddersfield, U.K., 2016. “The Consistency of Nothingness: Leopardi’s Struggle with ‘solido nulla’.” RISL (RivistaInternazionale di Studi Leopardiani) 8 (2012): 69-88. “Franca Ghitti: Nailing the Page.” In Franca Ghitti, The Grammar of Nails – Opere-Works 1963-2010 (New York: OK Harris Works of Art, 2010), 8-23. “Oh, the Streets of Rome: Dylan in Italy,” in Highway 61 Revisited: Bob Dylan from Minnesota to the World. Ed. by Colleen J. Sheehy and Thomas Swiss (Minneapolis: U. of Minnesota P., 2009), pp. 84-105. “The Rise and Fall of Reality: Socrates, Virtual Reality, and the Birth of Philosophy from the ‘Spirit of Writing’,” in Between Philosophy and Poetry: Writing, Rhythm, History. Ed. by Massimo Verdicchio and Robert Burch (New York-London: Continuum, 2002), pp. 27-39. “Blanchot’s Gaze and Orpheus’s Singing: Seeing and Listening in Poetic Inspiration,” in Panorama: Philosophies of the Visible. Ed. by Wilhelm S. Wurzer (London-New York: Continuum, 2002), pp. 45-54. "Folk Music and Popular Song from the Nineteenth Century to the 1990s," in The Cambridge Companion to Modern Italian Culture. Ed. by Zigmunt Baranski and Rebecca West (Cambridge, UK: Cambridge UP, 2001), pp. 325-335. "Consequences of Unlimited Semiosis: Carlo Sini's Metaphysics of the Sign and Semiotical Hermeneutics," in Cultural Semiosis: Tracing the Signifier. Edited by Hugh J. Silverman (New York: Routledge, 1998), pp. 48-62. "Frail Identities along the Canadian Shield." Differentia, 6-7, Spring-Autumn 1994, pp. 283-296. "Toward a Post-Democratic Society. On the Conflict between Ethnicity and Democracy," RLA Romance Languages Annual 1991, III. Ed. by Jeanette Beer, Charles Ganelin and Anthony J. Tamburri (West Lafayette, Indiana: Purdue Research Foundation, 1992), pp. 175-181. "What Happened to Being? On Hermeneutics and Unlimited Semiosis in Carlo Sini and Gianni Vattimo," RLA (Romance Languages Annual) 1989, I. Ed. by Ben Lawton and Anthony J. Tamburri (West Lafayette, Indiana: Purdue Research Foundation, 1990), pp. 94-97.